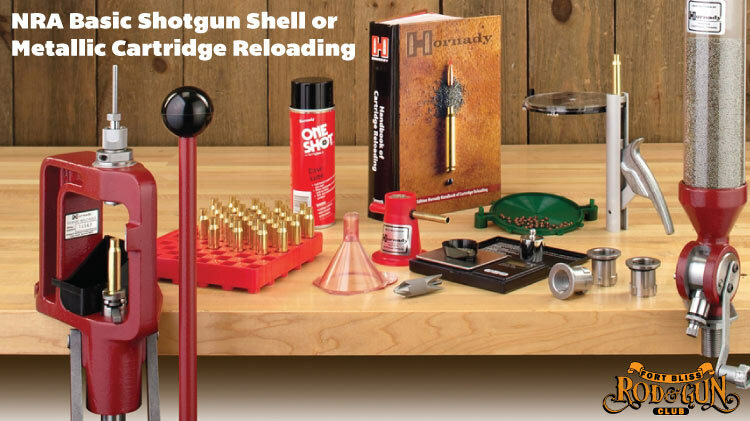 Date: Apr 7 2019, 8 a.m. - 5 p.m.
NRA NRA Shotgun Shell Reloading course teaches beginning re-loaders the basic knowledge, skills, & attitude necessary to safely reload shotgun shell..
Students are taught reloading safety, centerfire cartridge or shotgun shell components, using the reloading manual, reloading data, reloading equipment and the shotgun shell reloading process. Students who register for either class will receive the NRA Guide to Reloading handbook, the Basic Reloading Student Exam, a course completion certificate, NRA Gun Safety Rules brochure, a Basic Firearm Training Program brochure and a Course Evaluation form. $125 per person with a $25, non-refundable deposit. Registration is required and can be done online or by calling 915-861-4789.